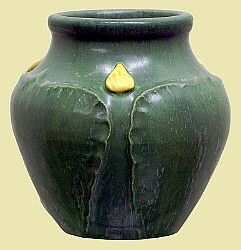 Founded in 2001 by Scott Draves, Door Pottery is dedicated to creating quality handmade pieces of art pottery. The revival of the Arts & Crafts Movement provided the opportunity for Scott to open his small studio in Madison, WI. With an eye for the Arts & Crafts aesthetic expressed in pottery shapes and glazes, Door Pottery�s goal is to create collectible pottery that is meant to be treasured for generations. As you browse thru the shapes below, you can get an enlarged view by clicking on the underlined description. 1)Door Pottery art pottery vases are NOT water tight and should not be used for live flowers. 2)We have limited stock in all the pieces shown below which are available for immediate shipment. All Door Pottery is thrown, decorated and glazed in Madison WI USA.